It’s a bit strange thinking of and planning ahead for Christmas during the hot hot summer we’ve been having in London. However, I’m planning to offer a great many small, easy-to-take-away original oil paintings at the Country Living Christmas Fair (7-11 November, Islington, London) and the Mayfair Christmas Market (30 November – 1 December, near the lovely Ritz Hotel, London): new paintings for the Christmas Season. This means painting a huge stock, and I’ve started with my beloved heritage tulips. Last year I bought bulbs of the 16th, 17th, 18th and 19th centuries from the gene bank Hortus Bulborum in Holland and planted these in my garden. When these glorious tulips surfaced in April and May this year I didn’t only paint them before they faded but I also took a large number of photographs for my tulip library. This somewhat, stressful against-the-clock activity serves me well now, because I can use my library to paint series after series of tulip paintings – perfect little presents for Christmas. Although this is some serious stock-building for the Christmas season, it doesn’t mean that these paintings are not available for purchase now. Please get in touch (artist@dutchoils.com or use the contact form) for any enquiries / reservations. 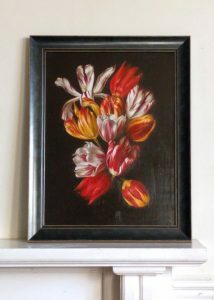 And of course if you would like your own bespoke tulip painting, why not commission one? I’ve always had a thing for history and heritage. 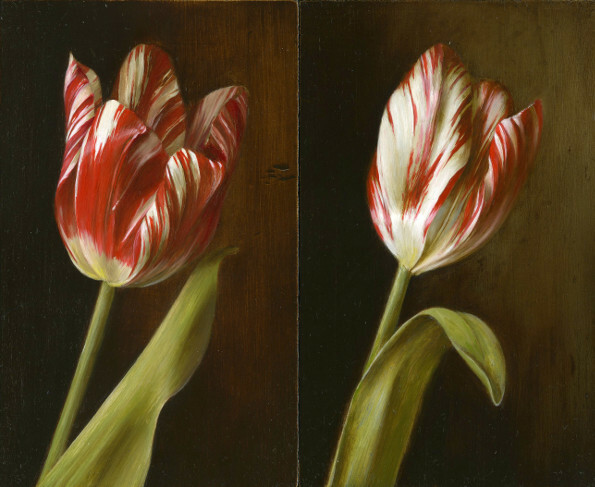 Being a Dutch expat in the United Kingdom (yes, don’t mention Brexit), I’ve long wanted to paint tulips and ideally tulips that were fashionable in 17th-century Holland, when we were even more under the spell of the tulip than we are today. Tulipmania (“tulpenmanie”or “tulpengekte”) was a period (1635-1637) in the Dutch Golden Age during which contract prices for some bulbs of the recently introduced and fashionable tulip reached extraordinarily high levels and then dramatically collapsed in February 1637 [Wikipedia]. Do any of the tulips from the tulpenmanie period still exist? Yes, old genetic stocks can still be purchased through Hortus Bulborum, a foundation in The Netherlands that functions as a gene bank and propagates historical heirloom bulbs. Some of these are no longer in commercial production (http://www.hortus-bulborum.nl). Every year I purchase several varieties from between 1595 and 1850 and plant them in my garden. I then paint series of paintings when the flowers surface, which is from mid-April onwards. I keep a photo library as well. You can see some of the paintings below. Most of the heritage tulips, unlike the ones we have today, have a distinctive crown-like shape and pointy petals; some varieties are comparatively short. Their colour is amazingly deep and rich. Painting them gives me an opportunity to celebrate Dutch cultural heritage. In the 2019 tulip season (April-May), I’ll be visiting the Hortus Bulborum to paint tulips in their gardens. I’ll be especially looking to record the legendary and rare Zomerschoon tulip, which was first intoduced in 1620 and was very popular during the Tulpenmanie period. I’ll also be on the look-out for the parrot tulip ‘Perfecta” (1750). Duc van Tol Rood & Geel (1595), Lac van Rijn (1620), Duc van Tol Max Cramoisi (1700), Wapen van Leiden (1750), Keizerskroon (1750), Zilver Standaard (1760), Gouden Standaard (1760), Duc van Tol Scharlaken (1850). Above tulips, and also: Tulipa sylvestris (<1600), Red hue (<1700), Paeony gold (<1700), Duc van Tol violet (<1700), Duc van Tol Rose (1700), Absalon Rembrandt (1780), Purple Crown (1785), Rose Louisante fol. var. (1850), Bessie (<1857), Spaendonck (<1893). Additionally planted: Fritillaria meleagris (1573).